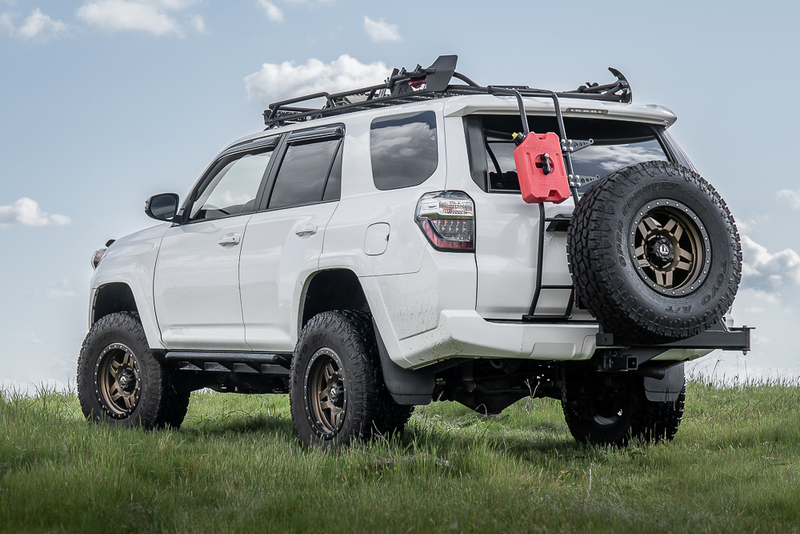 When it comes to tire carriers for the 5th Gen 4Runner, we have a few options. 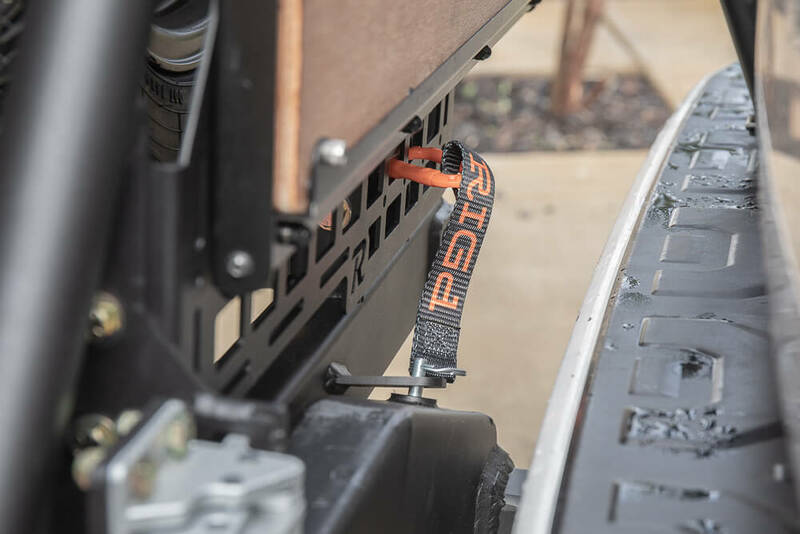 One of the more notable, more customizable options is the RIGd (pronounced Rigged) Supply UltraSwing™ Hitch Carrier. Some might attribute the term “tire carrier” to oversized tire alone, however, the RIGd UltraSwing™ serves this purpose and some. 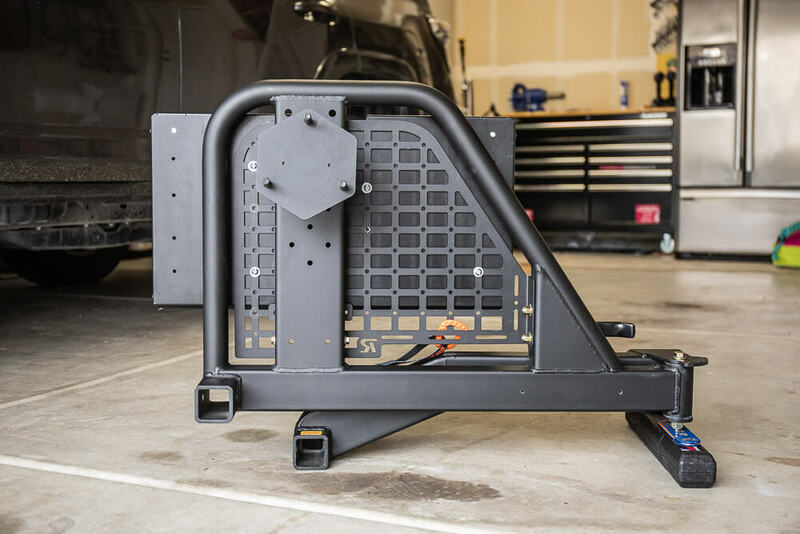 I am super stoked to give you guys a brief overview of why this tire carrier is currently one of the best options to consider, and I say that lightly as I rarely use the term “best” because there is usually no best. But, RIGd Supply really pushes that “best in class” envelope with their tire carrier. For the full review on this tire carrier, that is coming soon. This is our initial overview and step by step install. I have an oversized tire (285/75R17 – 33.8″), that does not fit in the spare tire location. With this comes the need for a tire carrier of some type. 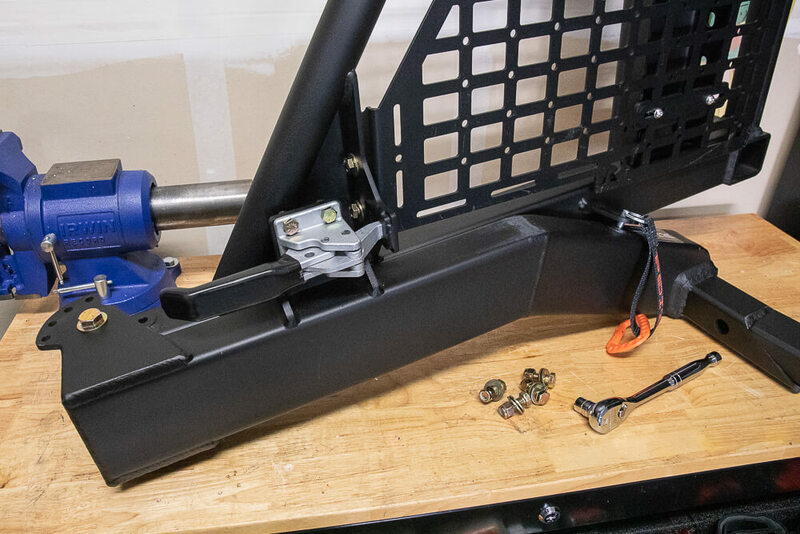 There are plenty of aftermarket rear bumpers with tire carrier swing outs, but some of those bumpers can get pretty pricey. With all the bells and whistles, some bumpers can cost over $3000. 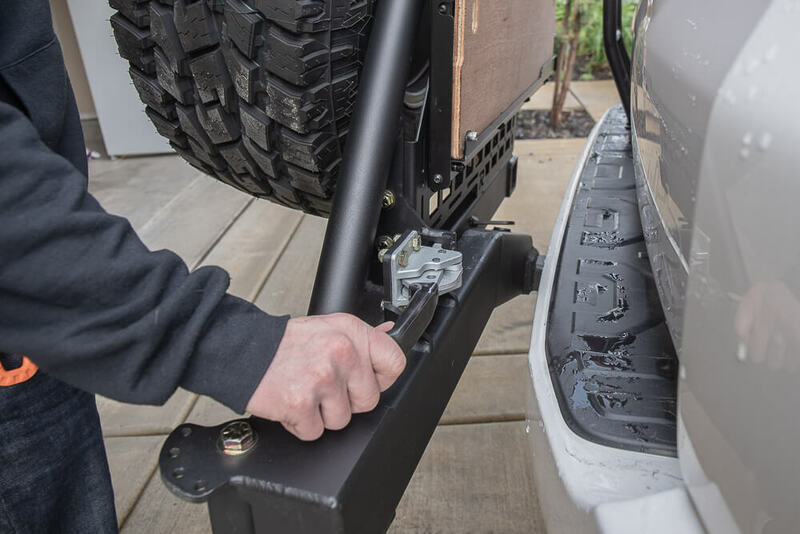 Rear bumpers also add substantial weight to the truck, which is also something to consider. The cost and weight of a full rear bumper led me to the hitch mounted tire carrier. 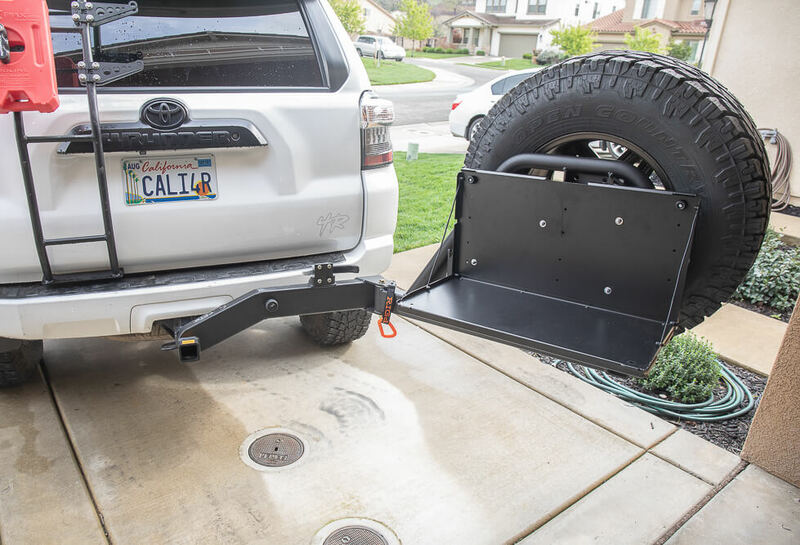 When looking into different tire carrier solutions for the 4Runner, I ran across a few options but none that I was 100% sold on. I was first between the Wilco Off-Road and the Detours Knucklebone tire carrier. Let’s just say I wasn’t thrilled with either of those options, but I knew I needed something. Then, I stumbled on the RIGd UltraSwing and was sold. This was exactly what my 4Runner was missing. And, if you are a bike guy, you will love this even more. To describe this tire carrier in a few words would be something like “It brings the term tire-carrier to a new level”. RIGd took everything that was broken with the traditional tire carriers and fixed it, plain and simple. From top to bottom the RIGd UltraSwing has just about every feature you might want with the functionality to boot. It’s full-time everything; tire carrier, bike rack, overland camp/cooking table + cutting board, MOLLE panel add-on, and above all else IT DOESNT WOBBLE like other tire carriers. 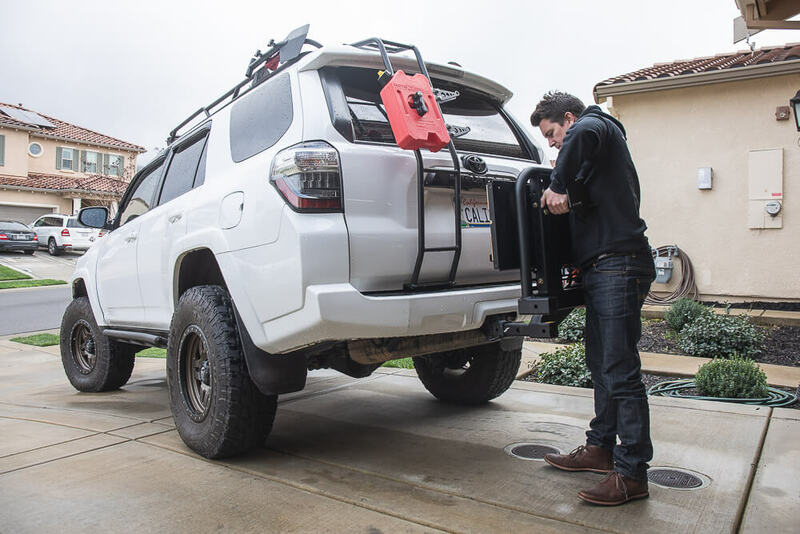 Tire Carrier Designed for the 4Runner? Whoa, whoa, whoa… wait this thing was designed just for us? Yes sir, yes it was. 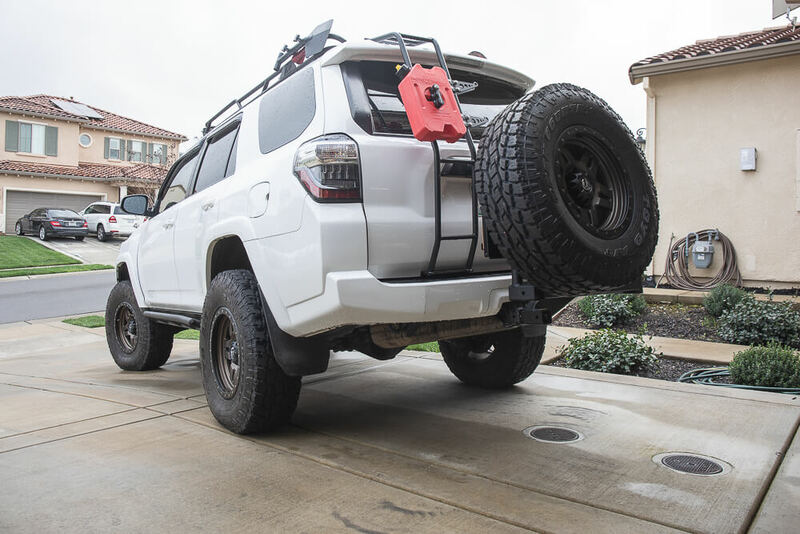 From the ground up, the RIGd Supply UltraSwing™ Hitch Carrier was designed specifically for the 4th and 5th Gen 4Runner platform. 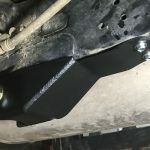 Note for V8 4th Gen 4Runners: this will only work on bolt-on factory hitch tucked into the bumper (V8 models with lower hitch will not fit) Call to confirm your fitment. The installation of RIGds UltraSwing is very simple and can be done with one person. 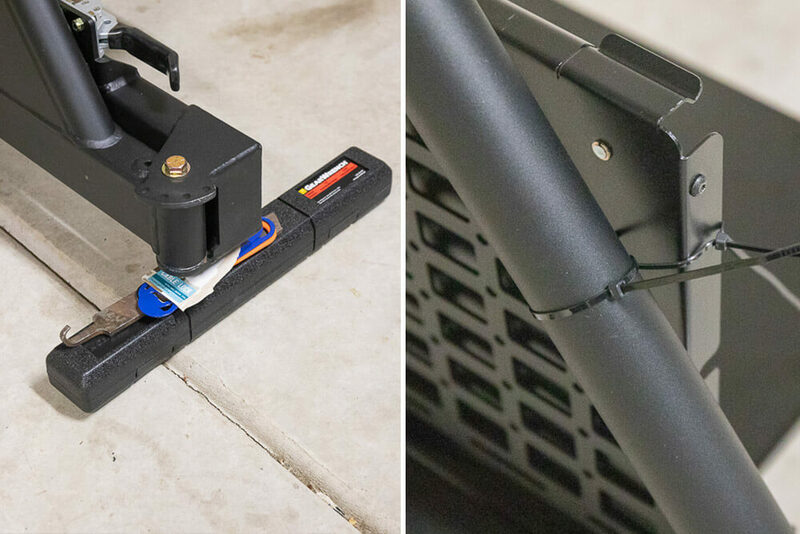 If you purchased the Rago Fab UltraPlate, then expect a very tight working space. 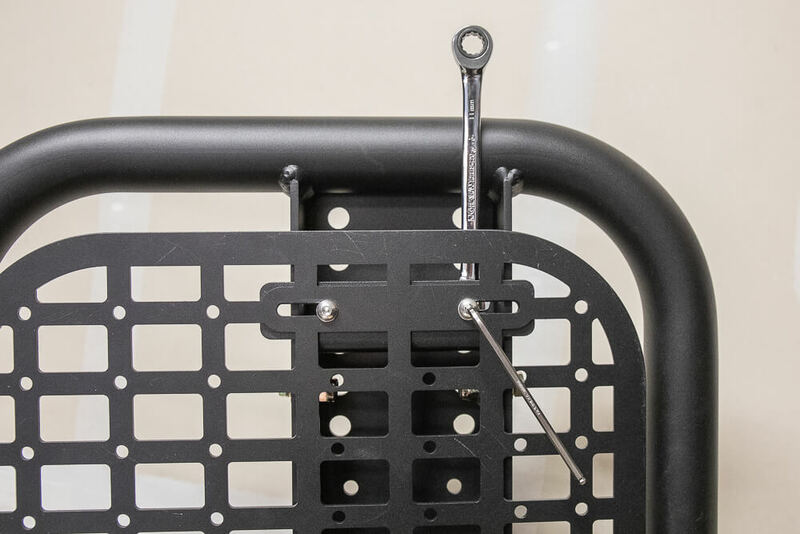 There are bolts that mount the UltraPlate to the UltraSwing and the spacing between the two is very tight. Please read through the entire install before attempting installation. This portion of the install is up to your interpretation and depending on which parts you ordered (UltraPlate, Camp Table, will depend on how you install each piece. I attached all hardware for the UltraPlate to the UltraSwing and started with the end near the latch. Moving over to the end near the carabiner clip pin, things get tight. 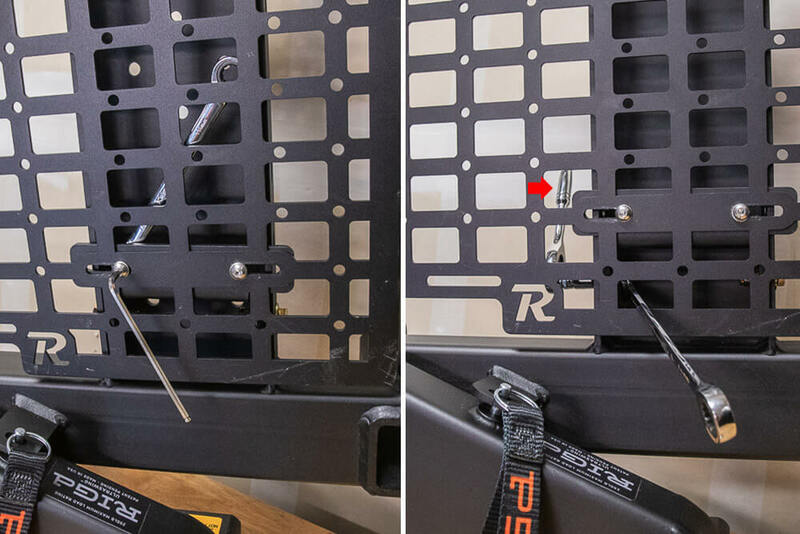 Pictured on the left, you can slide an open-end wrench between the panel and the UltraSwing in order to tighten down the bracket to the panel. On the right, you can use a 14mm open end wrench and a socket on the outside to tighten the bracket. I would recommend keeping everything loose at this point. This step goes directly with the step below. 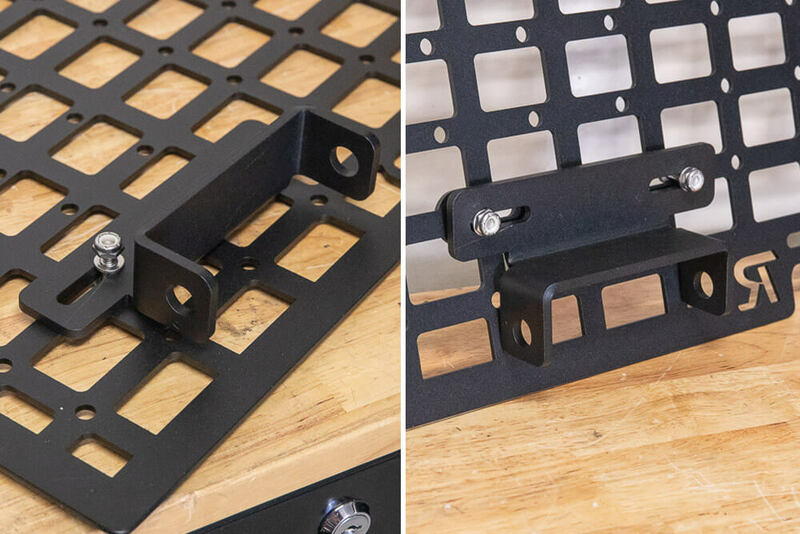 Start to position your brackets from the UltraPlate to the UltraSwing. Again, keep everything loose here until you start to understand where you want everything mounted down. Depending on your tire size will depend on where you set your wheel plate. For 32-inch or smaller tires, we recommend starting at the lowest set of holes. For 33-34-inch tires use the middle set of holes. For 35-inch tires use the highest set of holes. I have a 33.8″ tire and went straight for the second down position. It turns out that position is very close to the inside bolts that mount the UltraPlate bracket to the UltraSwing. It can be done, it’s just incredibly tight. Instead of finessing my way through, I wanted to see what the third down position looked like (position above). I will end up moving our tire to the top as I feel the tire sits low on the truck and it blocks the secondary hitch receiver. 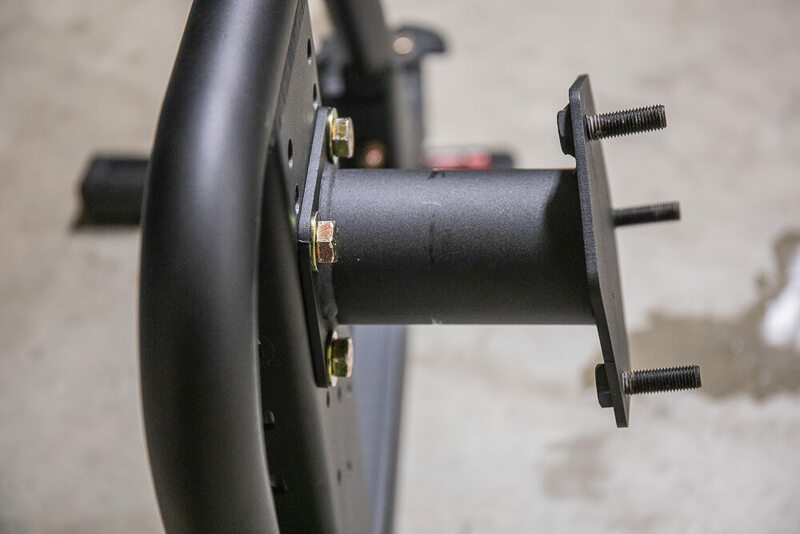 After you finalize your wheel plate position, tighten everything bolt down. 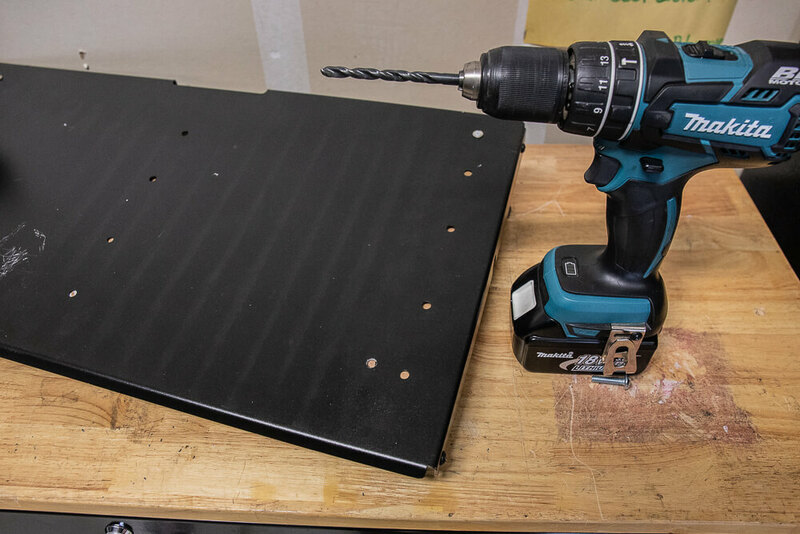 In order to mount the Front Runner Camp table to the UltraPlate, you need to mark and drill four holes. To find those holes, I leveled the UltraSwing then zip-tied the Front Runner table to the UltraPlate using the provided holes. You can slide the table up and down on the UltraSwing using zips to find level. To level the UltraSwing I used my torque wrench box, a file and then a couple of bottle openers. Get creative. 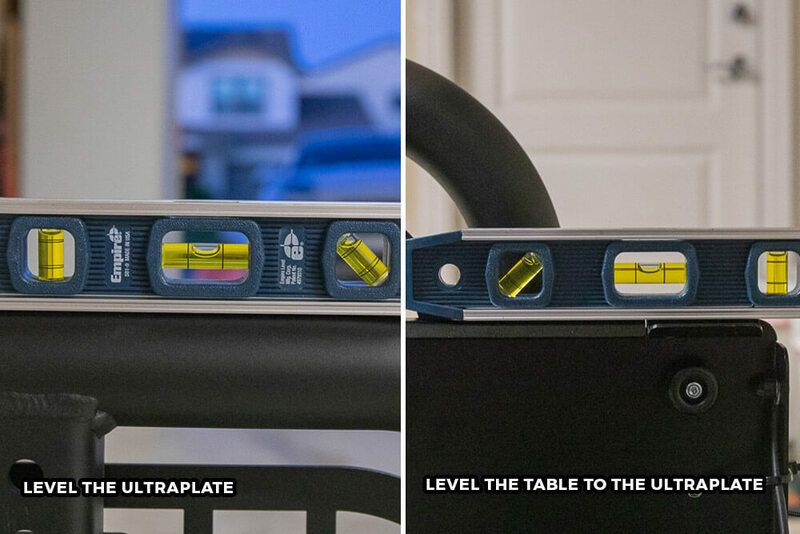 Once you have leveled both the UltraSwing and the Front Runner Camp Table, you can drill pilot holes. Here is a view of what the marks looked like after my pilots, starting with the hole in the top left position. 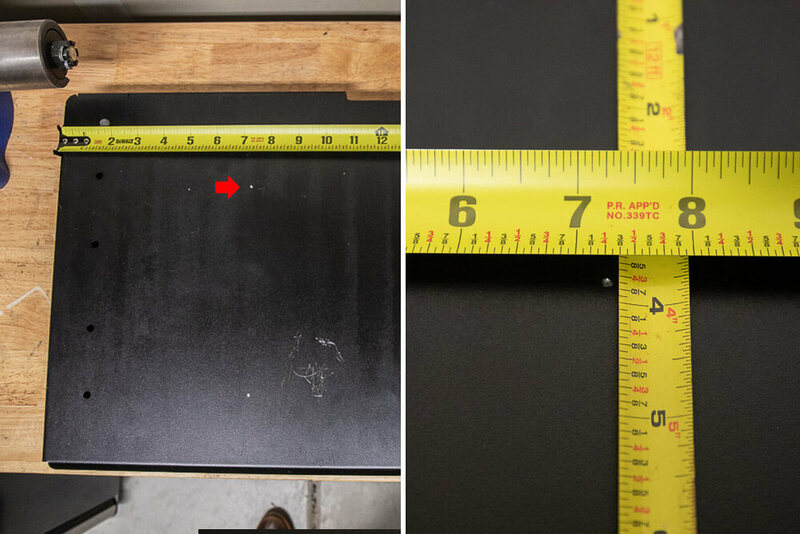 Place a piece of backing in between the top of the camp table and the base of the camp table to prevent accidental marks. In between the UltraPlate and the Camp Table, I placed a 1/4″ rubber grommet to prevent possible wobble. I know the RIGd is built rock solid and it’s known by now that wobble and noise are minimal but added measures are always nice to have, especially on added additions like the camp table. 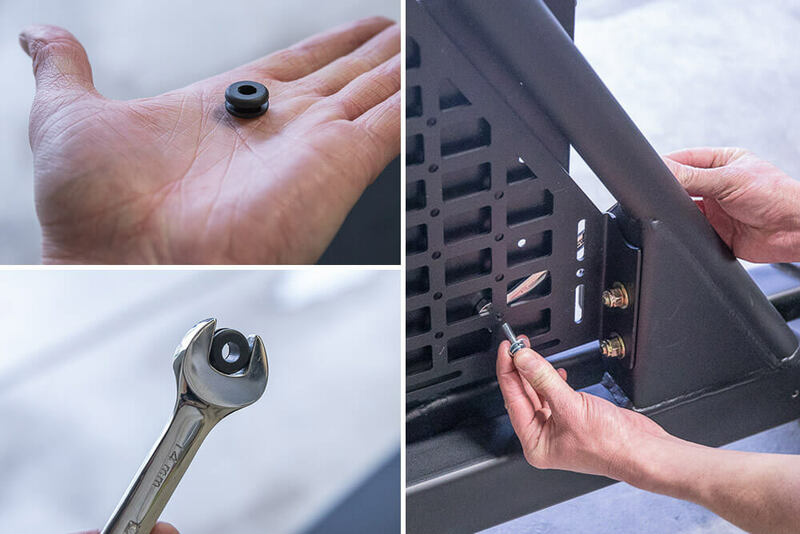 Using an open-end wrench, slide it and the spacer between the panel and the table, then attach your hardware. With everything tightened down and fitted to the UltraSwing, you are ready to install. Meet the core component of why the UltraSwing doesn’t wobble, the hitch receiver wedge. When you tighten down the wedge, it needs the least path of resistance. In the photo on the right, you can see a brass bolt in the center of the wedge. This is a bolt on the inside of the wedge. As you tighten the wedge down (from the outside looking in), the wedge slides up, securing the unit tight into place. NOTE: Do not forget your hitch pin. Now is a good time to throw your hitch pin through your UltraSwing. 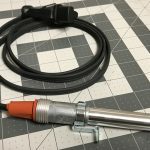 Grab a 12″ extension with a 3/4″ socket. You can tighten the wedge with 1/2″ drive and then come back and finally torque to 75 ft lbs. I did this alone, and It’s not like I pick up tires every day by my self, but there is an easy way to pick up a tire mounted on a wheel. If you roll your tire directionally upright (vertical), you can somewhat roll it up onto your knee and then lift the whole unit by the wheel with your legs. From there the tire and wheels are actually pretty light and can be handled accordingly. 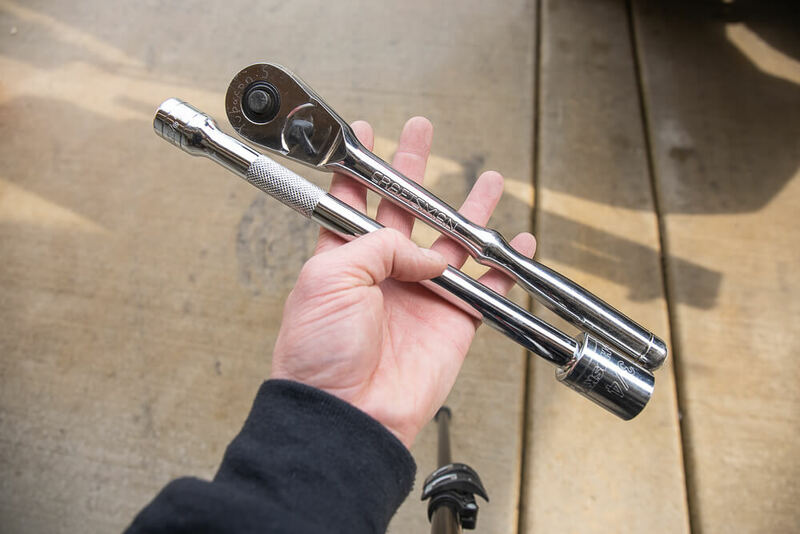 Finally, mount your tire onto your UltraSwing using the provided Lug Nuts that RIGd provides. 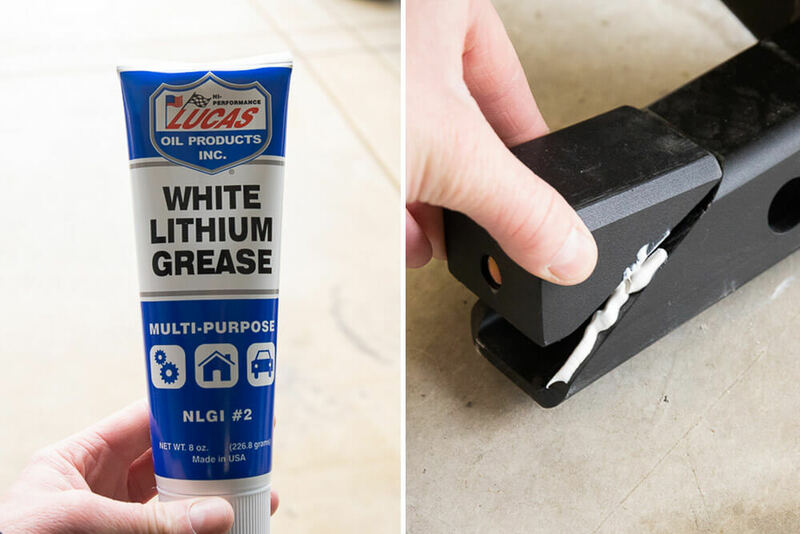 You can take this a step further and buy an anti-theft lug nut set or if you have aftermarket wheels, just order them directly from your wheel manufacturer. For a basic overview on how to use the UltraSwing, start by pulling the pin with attached carabiner clip. Once loose, you can disengage the swingout using the built-in latch. This latch, by the way, is incredibly beefy and feels damn nice in the hand. You can swing the RIGd UltraSwing out to four different locking positions using the provided pin with attached carabiner clip. From just about 180° to 90°, whatever direction you are looking to hang out with, lock the pin in place and call it chill. The UltraSwing was designed to accommodate many different directions. The fact that RIGd decided to option this swing out with the Front Runner camp table was pure genius and quite-frankly an instant change in breed of tire swingouts. 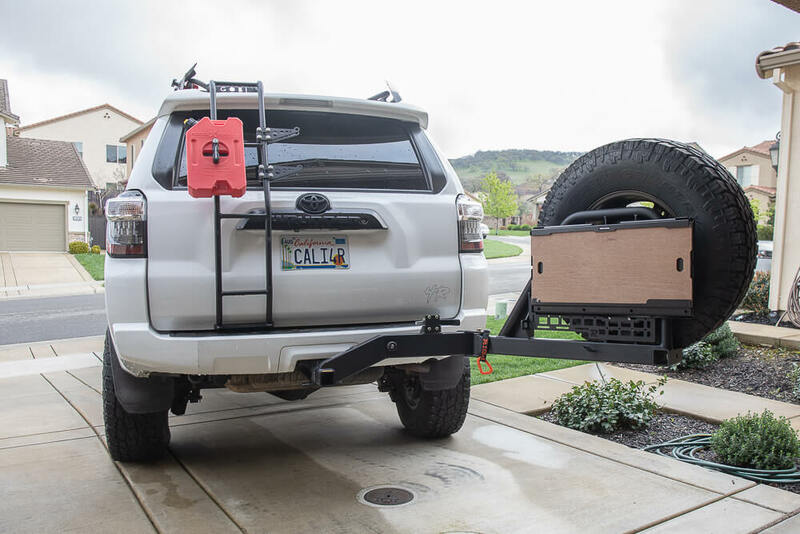 I don’t need to explain much here other than the fact that this is one impressive tire carrier and once you meet the UltraSwing, you will love it. I am beyond impressed with this unit. Here is a final shot with the Camp Table unfolded. Not pictured is the cutting board slide-out on the camp table. I will update the post in a day or two with a final shot here. UltraSwing just took best in class for tire carriers in this decade, for sure. Comment with a better one below, don’t worry… we’ll wait. Looks great, love the design and foldout table! Any rear view camera relocation ideas? We have a follow-up article dropping very soon that addresses the backup camera. You can go with a more permanent solution like the RSG backup camera kit or go with a company like Brand Motion. That option will allow you to keep your stock camera and add a rear view mirror style if you plan to take on/off.